Robert Zubrin (/ˈzuːbrɪn/; born April 9, 1952) is an American aerospace engineer and author, best known for his advocacy of human exploration of Mars. He and his colleague at Martin Marietta, David Baker, were the driving force behind Mars Direct, a proposal in a 1990 research paper intended to produce significant reductions in the cost and complexity of such a mission. The key idea was to use the Martian atmosphere to produce oxygen, water, and rocket propellant for the surface stay and return journey. A modified version of the plan was subsequently adopted by NASA as their “design reference mission”. He questions the delay and cost-to-benefit ratio of first establishing a base or outpost on an asteroid or another Project Apollo-like return to the Moon, as neither would be able to provide all of its own oxygen, water, or energy; these resources are producible on Mars, and he expects people would be there thereafter. Disappointed with the lack of interest from government in Mars exploration and after the success of his book The Case for Mars (1996), as well as leadership experience at the National Space Society, Zubrin established the Mars Society in 1998. This is an international organization advocating a manned Mars mission as a goal, by private funding if possible. Robert Zubrin was born April 9, 1952. Zubrin holds a B.A. in Mathematics from the University of Rochester (1974), a M.S. in Nuclear Engineering (1984), a M.S. in Aeronautics and Astronautics (1986), and a Ph.D. in Nuclear Engineering (1992) — all from the University of Washington. He has developed a number of concepts for space propulsion and exploration, and is the author of over 200 technical and non-technical papers and five books. He was a member of Lockheed Martin‘s scenario development team charged with developing strategies for space exploration. He was also “a senior engineer with the Martin Marietta Astronautics company, working as one of its leaders in development of advanced concepts for interplanetary missions”. He is also President of both the Mars Society and Pioneer Astronautics, a private company that does research and development on innovative aerospace technologies. Zubrin is the co-inventor on a U.S. design patent and a U.S. utility patent on a hybrid rocket/airplane, and on a U.S. utility patent on an oxygen supply system (see links below). He was awarded his first patent at age 20 in 1972 for Three Player Chess. His inventions also include the nuclear salt-water rocket and co-inventor (with Dana Andrews) of the magnetic sail. Zubrin is fellow at Center for Security Policy. In 2008, Zubrin founded Pioneer Energy, a research and development firm headquartered in Lakewood, Colorado. The company’s focus is to develop mobile Enhanced Oil Recovery (EOR) systems that can enable CO2-based EOR for both small and large oil producers in the United States. The company has also developed a number of new processes for manufacturing synthetic fuels. The Case for Mars: The Plan to Settle the Red Planet and Why We Must (1996), with Richard Wagner. This outlines the Mars Direct plan along with speculation about the economic, social and technical viability of future Mars colonization. Revised and updated in 2011. Entering Space: Creating a Spacefaring Civilization (1999). This ranges from the current status quo and innovative startups of the aerospace industry, through exploration and colonization of Mars, to a more futuristic look at humanity’s possible colonization of the solar system and the feasibility of interstellar travel with known physics. Mars On Earth: The Adventures of Space Pioneers in the High Arctic (2003). Zubrin recounts the origins and progress of the Mars Society’s Mars Analog Research Station project, including a variety of perils, both mundane and adventurous, that were overcome in establishing the first analog Mars habitat on Devon Island in the high Arctic. He offers highlights of what has been learned so far through that effort. First Landing (2001), a hard science fiction novel about a future Mars flight using the Mars Direct plan. The Holy Land (2003). This is an “SF satire on the Middle East crisis and the War on Terrorism, and concerns what happens when the liberal Western Galactic Empire relocates the oppressed Minervan sect to their ancient homeland of Kennewick, Washington, in the midst of a United States ruled by Christian fundamentalist fanatics“. The story was partly inspired by Čapek‘s War with the Newts. Benedict Arnold: A Drama of the American Revolution in Five Acts (2005). This is an effort to humanize and show the multiple dimensions of Benedict Arnold, and to contrast the democratic values embodied in the spirit of the Revolution with the socially bankrupt classism embodied in the British subjects who won Arnold to their side. Energy Victory: Winning the War on Terror by Breaking Free of Oil (2007). An expansion on his recent articles criticizing both reliance on oil and the potential for hydrogen energy, while highlighting the benefits of switching more toward methanol and ethanol. It carries an endorsement from former CIA director James Woolsey. How to Live on Mars (2008). A tongue-in-cheek technically accurate guidebook for Mars-bound Earthlings about how to survive and thrive on the Red Planet, written from the point of view of a 22nd-century Mars native. Merchants of Despair: Radical Environmentalists, Criminal Pseudo-Scientists, and the Fatal Cult of Antihumanism (2011). This traces the history of antihumanism over the last two centuries, from Thomas Malthusand the eugenics movement through to the anti-nuclear and global warming campaigns. Zubrin argues that these movements have all represented an attempt to gain oppressive political control through the restriction of human activities and freedom. Mars Direct: Space Exploration, the Red Planet, and the Human Future (2013). This e-book looks at the current situation of NASA and outlines a Mars Direct mission proposal with the SpaceX Dragon, and considers the implications of interplanetary exploration for humanity. Mars Direct: A Simple, Robust, and Cost Effective Architecture for the Space Exploration Initiative (1991), co-edited by D.A.V.I.D. Baker and Owen Gwyne. This contains a series of rationales and data regarding the proposal of plan Mars Direct. Islands in the Sky: Bold New Ideas for Colonizing Space (1996), co-edited with Stanley Schmidt. This is a collection of fifteen selected non-fiction entries that had been published in Analog magazine over the years; it includes five articles authored or co-authored by Zubrin, including “The Hypersonic Skyhook”, “Mars Direct: A Proposal for the Rapid Exploration and Colonization of the Red Planet” (co-authored with David A. Baker), “Colonizing the Outer Solar System”, “Terraforming Mars” (co-authored with Christopher McKay), and “The Magnetic Sail”. Notable additional contributors include Robert L. Forward and the godfather of terraforming, Martyn J. Fogg, each of whom contributed two articles. From Imagination to Reality: Mars Exploration Studies of the Journal of the British Interplanetary Society : Precursors and Early Piloted Exploration Missions (1997). From Imagination to Reality: Mars Exploration Studies of the Journal of the British Interplanetary Society : Base Building, Colonization and Terraformation (1997). Proceedings of the Founding Convention of the Mars Society (1999), co-edited with Maggie Zubrin. This contains articles corresponding to talks presented at the founding convention of the Mars Society in Boulder, Colorado in August 1998; it includes contributions from Zubrin, Buzz Aldrin, Martyn Fogg, and many others. On to Mars: Colonizing a New World (2002 Apogee Books), co-edited with Frank Crossman. This contains articles corresponding to talks presented at the annual conventions of the Mars Society in Boulder in 1999, in Toronto, Ontario, Canada in 2000, and at Stanford University, Palo Alto, California in 2001. On to Mars 2: Exploring and Settling a New World (2005 Apogee Books), co-edited with Frank Crossman. This contains over 130 articles corresponding to talks presented at the annual conventions of the Mars Society in Boulder in 2002, in Eugene, Oregon in 2003, and in Chicago, Illinois in 2004. An aging Robert Zubrin also appears as a background character in The Martian Race (1999) by Gregory Benford, a science fiction novel depicting early human explorers on Mars in the very near future. Benford, who is also an astrophysicist, is a longtime member of both the board of directors and the steering committee of the Mars Society. Robert Zubrin was also featured in a 2007 CBC Television documentary special, The Passionate Eye, dubbed “The Mars Underground”. The songwriter and musician Frank Black (alias Black Francis of the Pixies) penned an homage to Zubrin, “Robert Onion”, on the album Dog in the Sand. The lyrics are in the form of an acrostic, spelling “Robert The Case For Mars Zubrin”. In 2010 Robert Zubrin was featured in the Symphony of Science video “The Case for Mars” along with Carl Sagan, Brian Cox, and Penelope Boston. The fictional character Dr. Zachary Walzer in the 2010-11 independent VODO series Pioneer One was inspired by Zubrin. In 2016, Zubrin was one of several scientists and engineers interviewed in the National Geographic miniseries Mars. ^ Robert Zubrin (April 21, 2005). “Getting Space Exploration Right”. Space Daily. Retrieved July 14, 2013. ^ “Robert Zubrin”. Nasa. Archived from the original on March 6, 2012. Retrieved July 14, 2013. ^ “Robert Zubrin”. Pioneer Astronautics. Retrieved July 14, 2013. ^ Zubrin, Robert (1996). The Case for Mars. Touchstone. ^ Zubrin, Robert (October 10, 2014). “ZUBRIN: Iran is 10 months away from the A-bomb”. The Washingtion Times. Retrieved March 21, 2016. ^ “Aerospace engineer bets on space tech to cash in on gas flaring”. September 16, 2014. Retrieved September 18, 2016. ^ Jack J. Woehr (November 17, 2003). “The galaxy strikes back”. Enter Stage Right. Retrieved July 14, 2013. ^ “The Mars Underground”. CBC News. September 4, 2010. Archived from the original on October 26, 2012. Retrieved August 23, 2015. ^ “Robert Onion”. Frank Black Discopedia. Retrieved July 14, 2013. ^ ‘Pioneer One’, the indie sci-fi drama, was released on BitTorrent 6 years ago. Now we have a shot at a big-budget reboot! The following is the final summary report of Mars Desert Research Station (MDRS) Crew 208 (Medical Makers). A full review of the 2018-19 MDRS field season and crew activities will be presented at the 22nd Annual International Mars Society Convention, which will take place at the University of Southern California (USC) in Los Angeles on October 17-20, 2019. Medical Makers is a global community of innovators, patients, and healthcare providers who use low-cost technologies to make sustainable solutions to save lives, time, and money. Medical Makers host Medical Make-A-Thons worldwide to crowd-source low-cost, high-quality, life-changing 3D printable solutions for 3D4MD’s digital library. Our MDRS mission dates were from March 28, 2019 to April 7, 2019. We completed a total of 7 EVAs. Crew 208 Medical Makers XO and GHO processed Crew 207 Medical Makers drone maps and 3D printed contour scale models of MDRS. Two 3D printed MDRS elevation models will be provided to the Mars Society. Crew 208 Medical Makers compared the performance of a traditional and new drone controller during flight tests. Post-flight surveys were completed and qualitative feedback was obtained. Five crew members used a low-cost, high-fidelity thoracentesis trainer 3D printed on-site to acquire or maintain life-saving procedural skills to decompress a tension pneumothorax on a simulated patient. Three performance metrics were measured; performance score, procedure time and learner’s confidence. Crew 208 Medical Makers data has been compiled for analysis and manuscript preparation. Crew 208 Medical Makers showed that a renewable, green energy source can power a 3D printer to use biodegradable plastic to make customized medical devices that were previously printed on the ISS. Five crew members cycled for 1 hour per day for a total of 2 days per crew member on a bicycle to charge a battery that was used to power the 3D4MD 3D printing system. Crew 208 Medical Makers used this bike-powered battery to 3D print two customized mallet finger splints out of food-safe, biodegradable plastic. Crew 208 Medical Makers data has been compiled for analysis and manuscript preparation. Crew 208 Medical Makers provided feedback on a wearable sensor prototype for 3D printed prosthetic hands. To read the full mission summary, please click here. Indian Prime Minister Narendra Modi announced the anti-satellite test in a televised speech March 27. WASHINGTON — The Indian government announced March 27 it successfully fired a ground-based anti-satellite weapon against a satellite in low Earth orbit, a test that is likely to heighten concerns about space security and orbital debris. 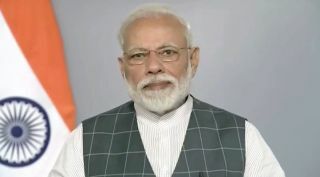 Indian Prime Minister Narendra Modi said that the country’s military successfully demonstrated an anti-satellite (ASAT) weapon in a test known as “Mission Shakti.” In that test, a ground-based missile, a version of an existing ballistic missile interceptor, hit a satellite at an altitude of about 300 kilometers. “It shows the remarkable dexterity of India’s outstanding scientists and the success of our space programme,” Modi said in a series of tweets announcing the test. Modi also made a televised announcement, in Hindi, about the test. According to a statement from India’s Ministry of External Affairs, the missile was launched from the Dr. A P J Abdul Kalam Island launch complex in the northeast part of the country. The missile struck an unidentified Indian satellite. “The test was fully successful and achieved all parameters as per plans,” the ministry stated. Neither Modi nor the ministry identified the satellite targeted by the test. Indian media speculated that the likely targets were either Microsat-R, launched in January, or Microsat-TD, launched a year earlier. Microsat-R is in a 262-by-280-kilometer orbit, while Microsat-TD is in a 353-by-361-kilometer orbit, according to tracking data by the U.S. military. The ministry said in its statement that the test was designed to minimize long-lived debris. “The test was done in the lower atmosphere to ensure that there is no space debris. Whatever debris that is generated will decay and fall back onto the earth within weeks.” It wasn’t immediately known how much debris the test generated, but some debris may end up in higher orbits with longer decay times. The test makes India the fourth country, after the United States, Russia and China, to test an ASAT weapon. Modi and his government said that the test both demonstrated the capabilities of India’s overall space program as well as showed its willingness to defend its satellites against attacks. The test, though, could increase concerns about the security of space assets in general. A February report by the Defense Intelligence Agency highlighted efforts by China and Russia to develop ASAT capabilities, including both ground-based missiles and other technologies, although neither country has performed a debris-generating test since China destroyed one of its own satellites with a ground-based missile in 2007, generating a large amount of debris that triggered international criticism. The United States performed its own similar test in February 2008, destroying the USA 193 satellite using a modified version of a ship-based SM-3 missile in a test called Operation Burnt Frost. The satellite was in an orbit about 250 kilometers high when it was successfully intercepted, and the U.S. government, which announced the test in advance, said it was designed to minimize the creation of debris. Most of the debris from that test did reenter within weeks, although the last piece of debris tracked from that test remained in orbit until late 2009. The Barboza Space Center is looking for creative ways to produce oxygen for 1,000 settlers on the planet Mars. Who is up for this challange? Suprschool@aol.com and http://www.SuperSchoolUniversity.WordPress.com. The atmosphere on Mars consists of 96% carbon dioxide and less than 0.2% oxygen (Earth has about 21% oxygen). If astronauts tried breathing the air on Mars, they would quickly suffocate. How can we create oxygen on Mars? Do our biology books have an answer to this question? How can we produce oxygen for 1,000 people? What ideas can you share with high school students in the USA? We inviete you to read this solution that we fournd on the Internet. Who has any creative ideas to add to this conversation? NASA is already in the planning stages for a future trip to Mars, and one of the hurdles they must jump is how humans will breath on the Red Planet. However, instead of carrying huge oxygen tanks, future human missions may actually utilize methods to actually produce the life giving gas on the planet itself. NASA is interested in not just paying a visit to Mars, but is also looking at creating ecosystems that could support life for future missions to the planet. As part of this goal, it is funding the Indiana-based company Techshot, Inc. to research a solution that will produce oxygen that won’t rely heavily on the Earth for future Martian colonies. “This is a possible way to support a human mission to Mars, producing oxygen without having to send heavy gas canisters,” chief scientist at Techshot, Eugene Boland says. “Let’s send microbes and let them do the heavy lifting for us,” he added. The experiments by Techshot are carried out in its “Mars room.” This room simulates the atmospheric pressure, day and night temperature changes and solar radiation experienced on the surface of the Red Planet. Using Martian soil, the scientists test the feasibility of using ecosystem-building pioneer organisms to produce oxygen. At the same time, these organisms could also remove the nitrogen from the soil of Mars as well. Boland believes that habidable biodomes that “enclose ecopoiesis-provided oxygen through bacterial or algae-driven conversion systems” could exist on the Martian surface in the near future. NASA has already states that its goal of landing astronauts on the surface of the Red Planet is vital to its mission to search for new life. That search, of course, has already begun. Recently, NASA’s Mars Curiosity rover found evidence of fixed nitrogen and carbon-containing organic molecules on the surface. These ingredients are key for life and the findings have sparked curiosity among scientists if there could be some form of life on Mars. Scientists now believe that at one point in time Mars looked very different than it does today. It is now believed that ancient Mars once held waterways and even vast oceans in the northern hemisphere making it a good candidate for life, at least at one point in time. Whether there is still any life hidden away on Mars is a question that still must be answered and NASA hopes a manned mission will be the key to our search for life outside of Earth. The little craft’s demonstration mission could lead to big things. The 4-lb. Mars Helicopter will travel to the Red Planet with NASA’s next Mars rover, which is scheduled to launch in mid-2020. A few brief hops in the Martian air two years from now could help open alien worlds to an entirely new kind of exploration. An autonomous mini-helicopter will fly with NASA’s Mars 2020 rover mission, which is scheduled to launch in July of that year and land on the Red Planet in February 2021. The bantam chopper is a stripped-down technology demonstration, and it will make a maximum of five short sorties in the Martian atmosphere. Success in this pioneering work would be a big deal, extending the reach of humanity’s robotic explorers, which are currently restricted to the surfaces of alien worlds or the dark realms far above them. 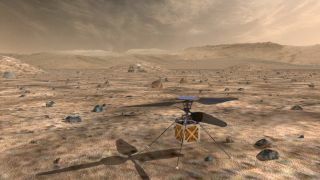 “We envision helicopters opening doors to new types of exploration on Mars,” Håvard Grip, flight-control and aerodynamics lead for the Mars Helicopter, said Wednesday (March 20) during a presentation with NASA’s Future In-Space Operations (FISO) working group. One day, more-advanced versions could serve as scouts for rovers or explore the Red Planet on their own, added Grip, who’s based at NASA’s Jet Propulsion Laboratory and the California Institute of Technology, which are both in Pasadena. Will Nuclear Megaton Shockwave Avert Earth-Bound Asteroid? The Mars Helicopter weighs 4 lbs. (1.8 kilograms) and has a body about the size of a softball. It carries a range of avionics and communications gear, a small solar panel, rechargeable lithium-ion batteries, “survival heaters” to keep its electronics warm through the frigid Martian night, and a navigation camera. The helicopter will travel to Mars attached to the belly of the car-size 2020 rover, which will hunt for signs of ancient Red Planet life and collect and store samples to return to Earth in the future, among other tasks. A month or two after the rover lands on the Red Planet, the chopper will drop down and hit the dirt itself. The little vehicle will then make a series of short flights, each of which will last about 90 seconds and reach a maximum altitude of 16.5 feet (5 meters) or so, Grip said. To generate enough lift, the Mars Helicopter sports two stiff rotors that measure 3.9 feet (1.2 m) long — pretty much as big as the team could make them, Grip said. And the rotors will spin at 2,400 revolutions per minute, about 10 times faster than the blades of a chopper on Earth, mission team members have said. The team has put this design through its paces many times in Mars-like conditions here on Earth, Grip said. Indeed, the little craft is pretty much ready to go. “The flight model is built and more or less tested,” Grip said. The ultimate test, of course, will come on Mars. “The Mars Helicopter’s initial flight will represent that planet’s version of the Wright brothers’ achievement at Kitty Hawk and the opening of a new era,” Susan Gorton, manager of NASA’s Revolutionary Vertical Lift Technology project, which has been working with the Mars Helicopter team, said in a statement last week. “For those of us whose research revolves around all things related to flight, that would be a remarkable, historic moment,” Gorton added. Such historic moments may not be limited to Mars’ skies. NASA is considering launching a quadcopter lander to Titan, Saturn’s huge, haze-enshrouded moon. This mission, called Dragonfly, would fly from spot to spot on Titan, investigating the complex chemistry occurring on the potentially life-supporting moon. Dragonfly is one of two finalists for a mid-2020s launch slot under NASA’s New Frontiers program of medium-cost missions. The other contender is a comet sample-return mission called CAESAR. NASA is expected to announce its selection later this year. The Mars Helicopter and Dragonfly teams have not collaborated to date, Grip said. NASA’s Mars 2020 Rover Is Unique. And So Is Its Paint Job. Mike Wall’s book about the search for alien life, “Out There” (Grand Central Publishing, 2018; illustrated by Karl Tate), is out now. Follow him on Twitter @michaeldwall. Follow us on Twitter @Spacedotcom or Facebook. 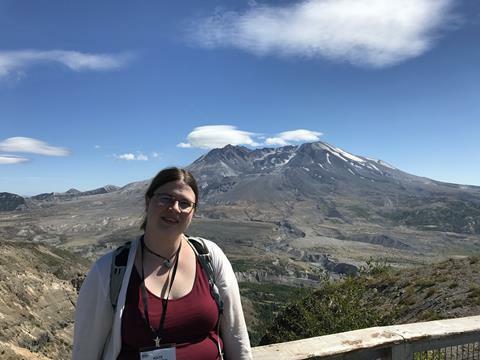 Kate Saunders first realised that volcano science fired her up during a lecture as a first year geoscience undergraduate student at Royal Holloway, University of London, UK. ‘I can remember thinking wouldn’t it be really good if I could do that as a career,’ she says, before quickly dismissing it as a pipe dream. Her interest lay dormant for two years, until a field trip to her first volcano – Mount Ruapehu in New Zealand. The trip was organised by Victoria University of Wellington, where Saunders was on exchange as part of her degree course. ‘The textbook suddenly came alive for me.’ With her interest reawakened, Saunders approached one of the lecturers and asked if he was looking for PhD students. He was – and just like that Saunders took a major step towards her dream career as a volcanologist. ‘Everything fitted together really nicely,’ she remembers. Today, Saunders is a lecturer in volcanology at the University of Edinburgh, UK. Twenty years ago, however, she wasn’t sure that academia was right for her. ‘I decided at 18 that I didn’t want to go to university,’ she explains. Instead, she moved to Sweden to work as an au pair. After a year she dipped her toes into university life, studying remotely for a part-time for a certificate in natural sciences with the Open University. Enjoying the experience, she relocated back to the UK and enrolled full-time on a degree course in London. Saunders’ PhD was on, and her research niche remains, probing volcanic rocks to reveal the chemical fingerprints of past volcanic eruptions. ‘The question everyone wants answered when a volcano starts to rumble is: is it going to erupt?’ she explains. Often, they just remain dormant. Even so, every year about 60 volcanoes blow their tops. Some, such as Mount Etna in Italy, are repeat offenders; others, like the 1980 eruption of Mount St Helens, US, take the world by surprise. According to calculations by the University of Bristol, UK, volcanic eruptions have killed around 280,000 people since 1500, 2000 of these since the turn of the century. ‘By looking at past eruptions, we can see if there are any patterns to look out for,’ Saunders says. ‘If a volcano starts to show signs of unrest today, is it going to days, months, years, or tens of years before a big eruption?’ When magma erupts from a volcano it rapidly cools to become volcanic rock. 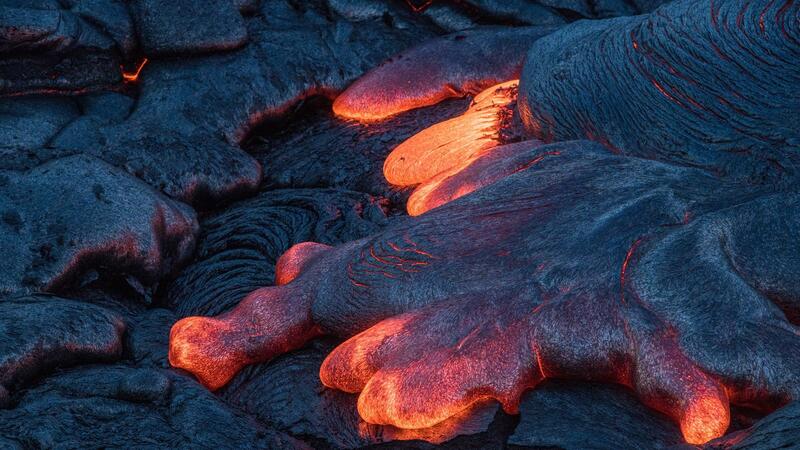 This rock hosts tiny mineral crystals, and it is these that hold the chemical clues to the magma’s past. To obtain the rock samples, once every 18 months Saunders goes out into the field. She has recently returned from a two-month sample-collecting trip to New Zealand. Other volcanoes she has worked on include Mount St Helens and those on the Indonesian island of Sumatra. One of these, Mount Sinabung, unexpectedly awoke from a 400-year dormancy in 2010. Prior to the 2010 eruption, no monitoring or studies had been carried out on that volcano. 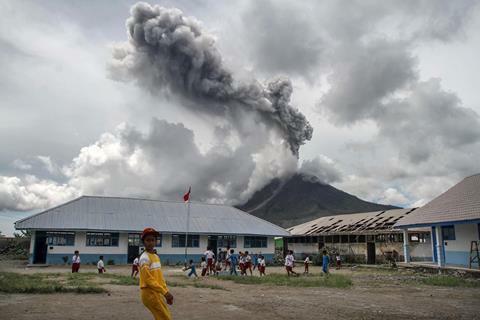 Children play at an elementary school as the Mount Sinabung volcano spews smoke in Karo on November 13, 2017. After her PhD, Saunders moved to the University of Bristol – postdoc positions are like gold dust in New Zealand. ‘If I wanted to stay in academia I couldn’t stay in New Zealand, so I decided it was time to come home,’ she explains. Three years later she started applying for permanent academic positions, and landed two offers on almost the same day: one at the University of Edinburgh and another at the University of Uppsala in Sweden. She said yes to both, and spent the next five years running research groups in both locations. When off duty, Saunders is an enthusiastic supporter of Girlguiding. She has been an active member for over 30 years and has held leadership positions for the past 20: as a Brownie leader in the UK, Scout leader in Sweden and a Ranger leader in New Zealand. She says that the skills learnt through this volunteer work have been instrumental to her academic career. ‘A lot of my organisation, team work and leadership skills have all been learnt through Girlguiding,’ she says. Brownie camps also prepared her for running residential field courses. Saunders also credits her willingness to chase opportunities as instrumental in her landing her dream job. While volcanology academic jobs remain rare, there are many more volcano monitoring jobs around the globe both in government organisations, such as the British Geological Survey, or private companies. The Barboza Space Center will be using drones to simulate conducting science on Mars. Our drones wil be flying in the Rewpublic of Cabo Verde and the USA.